Sometimes you have to leave home to find the things you need. I tested that theory at the end of June, when I took Betsy and Emily on a road trip through Iowa. After three days we reached our destination. Read on to learn what awaited us. I was shocked. Visit my in-laws on the way home from the honeymoon? I would not. We never missed another one. For one thing, Lee and Leah (my in-laws) needed all hands on deck just to pull these parties off. For another, they were the highlight of our summers. Every year we arrived a few days early, along with Jon’s sister and family, and dug into the chores. We planted, mulched and mowed. We counted plates, put out flags and moved picnic tables down from the barn. And oh! The decorations! 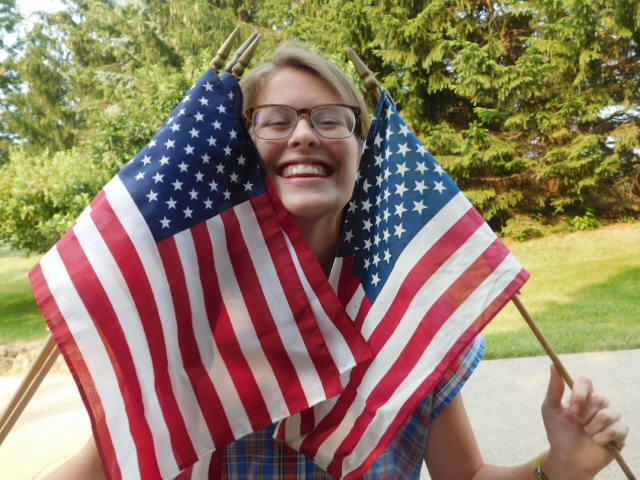 There were floral arrangements and patriotic teddy bears, and yards and yards of bunting. 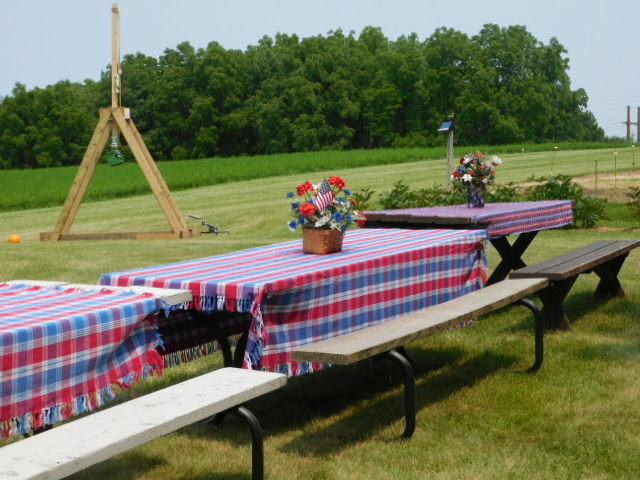 Picnic tables (catapult in the background)…. This party had rules that didn’t change. The invitations were permanent, but if you planned to show up, they wanted an RSVP. Leah made fried chicken, Lee made homemade ice cream, and the rest of the food was up to the guests. There would be no paper or plastic ware except napkins, and the napkins had to be patriotic. Dishes would only be hand-washed if they couldn’t go in the dishwasher. Guests were not to do kitchen duty. The crowd averaged between thirty and sixty. Some guests were lifelong friends, while others only passed through. All appreciated the open-handed hospitality of their hosts. The grandchildren grew up going to those parties: First as babies who smiled shyly at the strangers and napped in closets after dinner. As toddlers they dug in the sand box, made bubbles with giant wands, and hid from the strangers. When they grew older, they sat in the loft and taught each other bloody card games with names like War and Egyptian Rat Slap. 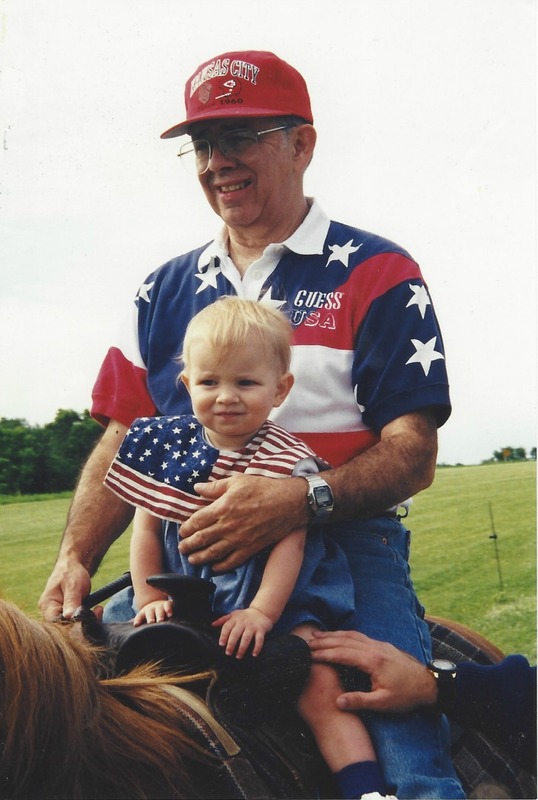 One year, as a special treat, each child got to ride Toots the bad-tempered horse while Grandpa held the reins. That went about as well as you’d think. Who could blame her? Jon and I celebrated our twenty-fifth anniversary last month. Twenty-five-plus years of parties could make anybody tired. 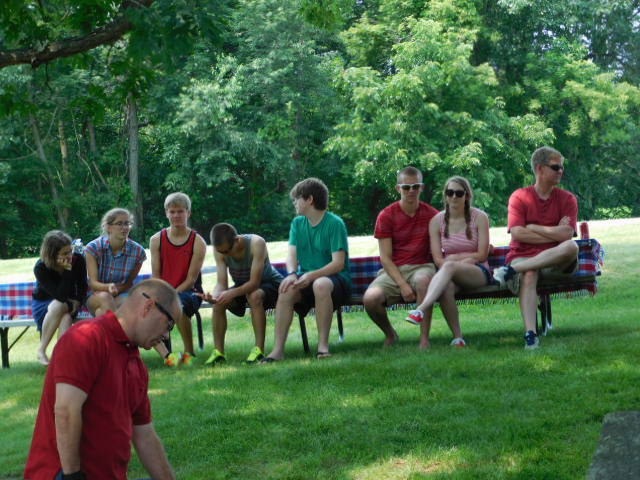 This year we counted plates and put out flags and moved picnic tables. Lee made the ice cream and Leah ordered fried chicken from the place down the road, as she’s done for a couple of years. Most of the regulars came, though we missed a few who can no longer make it. Fittingly, a couple of new people joined us. The buffet table held salads and rolls and pies next to three platters heaped with chicken. Before we dug in we said grace, followed by the singing of God Bless America. People visited in the shady yard long after the food was gone, swapping news and retelling old jokes. The cousins built a catapult in the barn the week before and used it to fling cantaloupes with scientific precision. 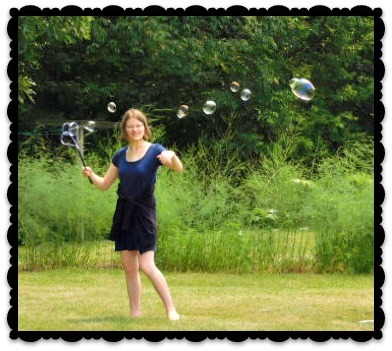 When not catapulting, they blew the best bubbles ever. Our oldest nephew’s girlfriend joined us, a sign of change if there ever was one. There were no tears, no nostalgia or regret. We emptied the dishwasher and took the tables back to the barn. We did the thing up right, and it is finished. What a wonderful legacy your in-laws have left and sweet memories for all of you! Your comment was so well-timed! I just wished my Mother-in-Law a happy birthday. They have left a legacy in so many ways. Tradition is such a great thing…glad you had so many years of your family’s tradition!